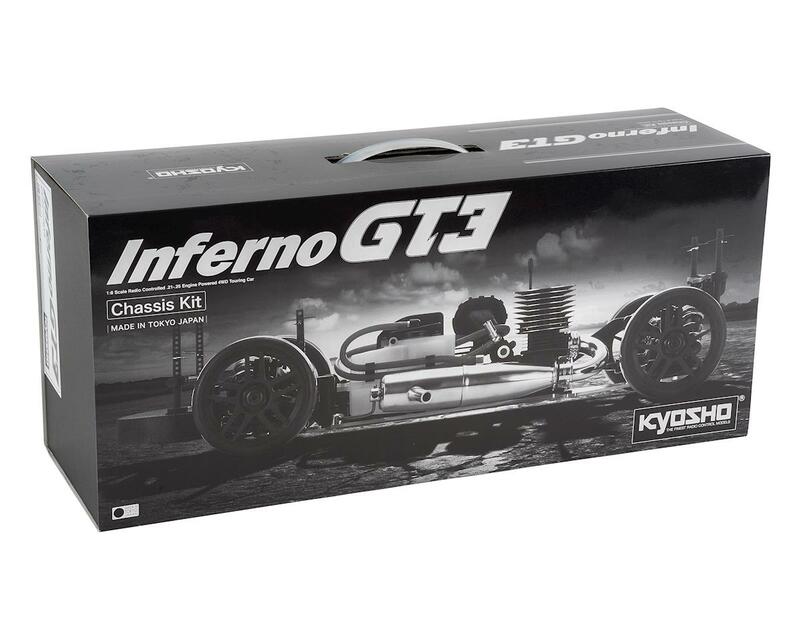 The Kyosho Inferno GT3 1/8 Nitro 4WD On-Road Touring Car Kit is the ideal model to compete in the 1/8 GT class. Based on the Inferno MP9 TKI4 1/8 GP buggy, the GT3 represents a complete change from the previous Inferno GT2. Advanced specifications deliver incredible performance thanks to short Big Bore Shocks and machine cut Duralumin shock mounts, a lighter diff, optimized weight distribution and improved braking. All of these traits are combined to create the durability and reliability needed by competition racers throughout a long race. The GT3 is the next step in the evolution of the 1/8 GT class, and is fully equipped to compete and win at the highest level. NOTE: Engine, tuned pipe, wheels, tires and electronics shown in photos are for illustrative purposes only and are not included. 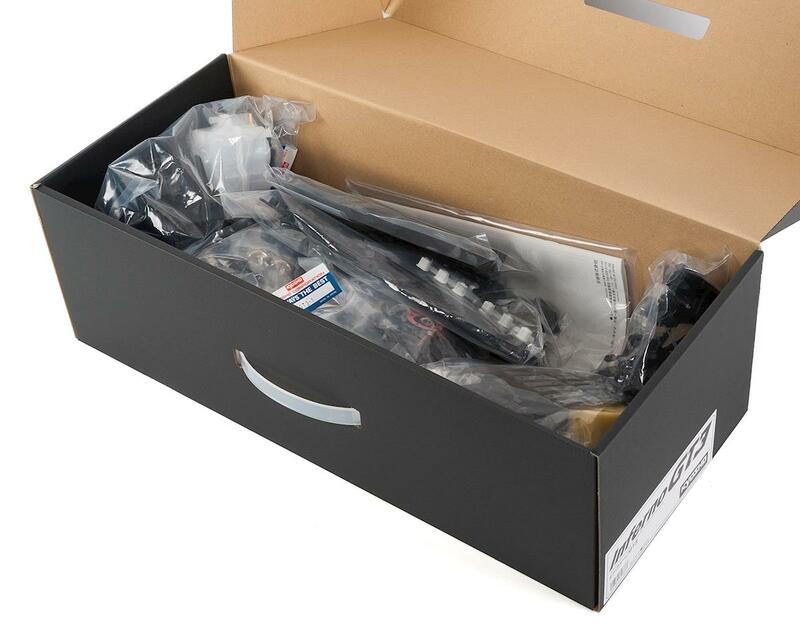 See needed to complete list below for a full list of items required to complete the model. 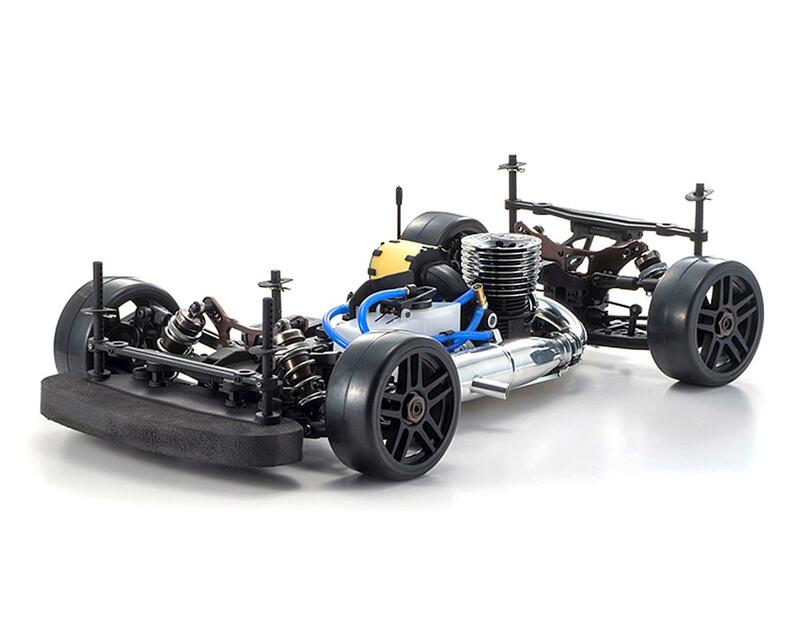 Pure racing chassis kit based on Inferno MP9 TKI4, designed for circuit racing. Significantly lighter diff than the GT2 realizes improved throttle response. Short Big Bore Shocks and shock springs based on buggy version design. High-rigidity shock stay realizes full performance of oil shocks. New type large urethane bumper increases crash resistance. Choice of forward and rear mounting positions available for body mounting post. Bodies for GT2 can also be mounted. Includes the proven 2-speed unit with clutch shoes from the GT2. Gun metallic aluminum parts enhance the GT3’s formidable style. Standard and optional parts for the MP9 can be installed to further increase performance.